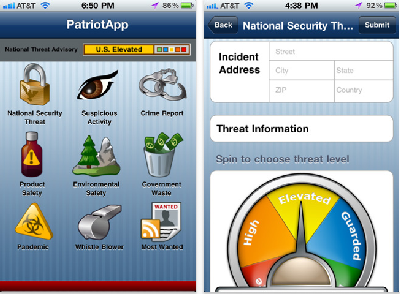 If it's the $1.99 price that has been preventing you from being properly patriotic then hold back no more - until Christmas you can download the PatroitApp for free. The application simplifies reporting suspicious activity, instantly sending photograph-supported e-mails to federal bodies who need to know whether your neighbour is stockpiling weapons of mass destruction or just enriching uranium on the side: it's your patriotic duty to report anything you don't like the look of. The application was launched on September 11, but it seems Americans just aren't patriotic enough to shell out a couple of dollars for the sake of world security, and despite being available in various other territories (including the UK) foreign nationals have also proved reluctant to cough up for the facility to easily report on their comrades, despite the stirring music (if the office allows it then do crank up the volume, but try to resist the urge to stand up and salute).